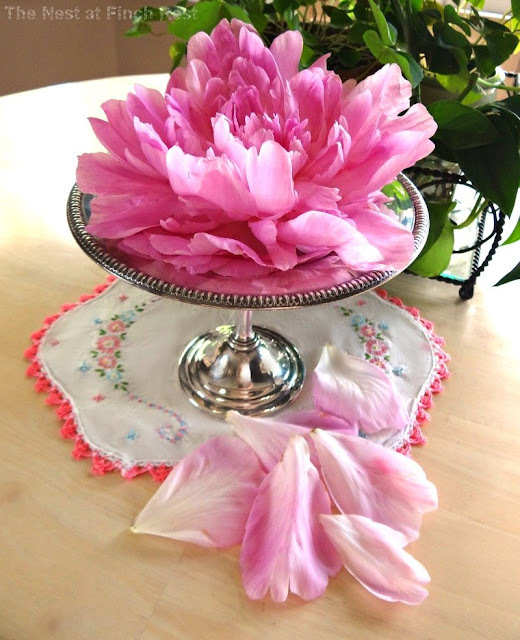 Ah........peonies. Well this is the last of the beautiful dark pink peonies as we were hit today with a very heavy rainstorm. We truly needed the rain, but it SURE puts an end to those delicate beauties. Their petals are the sweetest, thinnest most delicate things; makes a rose petal seem made of metal in comparison. These petals are nearly transparent! These flowers were given to me by a friend for Valentine's Day and I placed them in a well-drained teapot. I use tiny river rocks on the bottom of all my planters....and a heavier bit for them if there is no drain hole on the bottom, which is the case with a very old teapot! And -yay- these Kalanchoe are blooming again! They had to be heavily cut back because they get very leggy - and looked just awful for a bit....but if they stay cool with bright light and let them dry out between waters they come back nicely (not as heavily bloomed this time though) but still very pretty. And shall miss it until its return again next spring. Oh! The glorious, girlie, awesome, wonderful PINK! 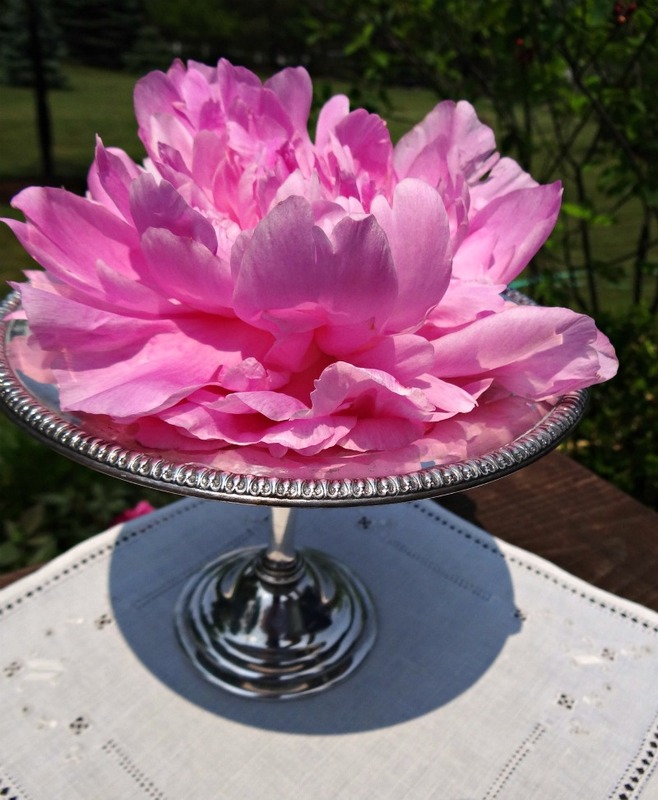 I grew peonies, the same color as yours! The the plants were destroyed when our house was lifted (yes, it's on a lake and it was sinking!!). They make wonderful dried flowers, too. Lucky girl! Yes, truly beautiful! I guess that's why we have seasons. So we appreciate it more when it comes back round. What a lovely way to display that glorious bloom. Just beautiful and I heart the little teapot. Such a beautiful flower, Michele, and it looks great on that silver piece. What a beautiful way to display one of the most beautiful flowers. That pink is so pretty. What is that little plant in the teapot? Have a Happy pink Saturday. I have edited and added that info to this post. I really should have all along, but just didn't think of it! You take such pretty photos, Michele. I love seeing that precious peony displayed on the silver compote...it's perfect. I hope you aren't right about the peonies in our area, ours aren't out yet, been waiting and waiting. Your pink one is a beauty, they are so delicate. 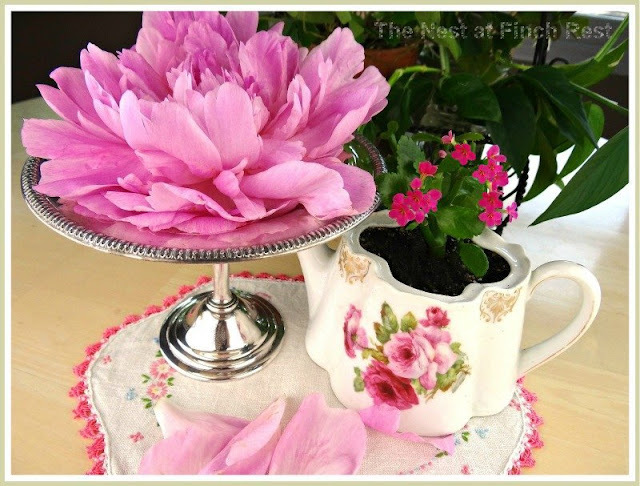 What a scrumptious peony and vintage teapot! Love your photos! 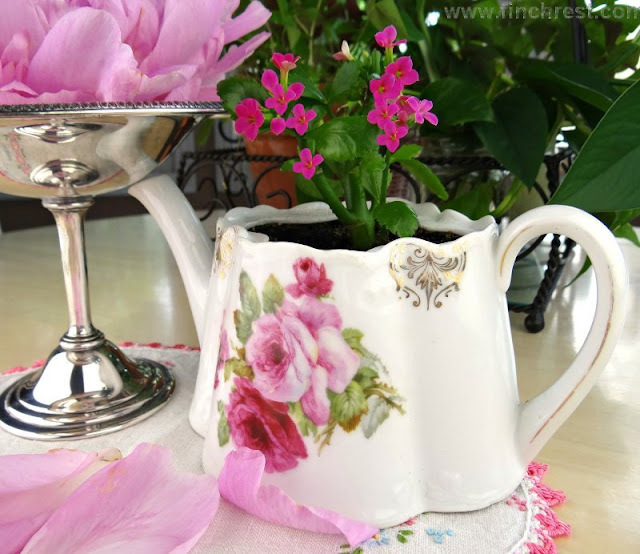 The silver and pink and vintage teapot are delightful! Thanks for sharing and I hope you have a beautiful day. Swweeeet, nothing is as swoon worthy as Silver adorned with Pink Peonies....love love love this!! 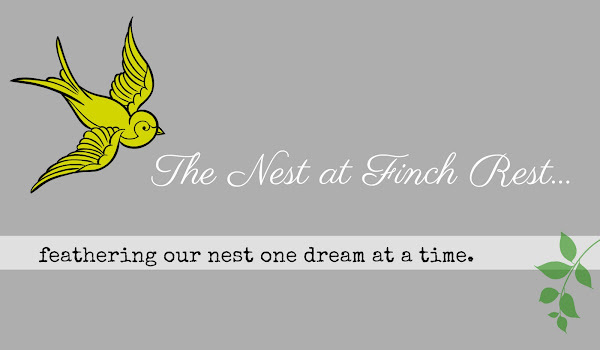 Just came across your blog today for the first time. Peonies, what lovely flowers. I planted a peony about 5 or 6 years ago now and the most flowers I've ever had on there were 5! So last year we moved it to a better location...and now there's one single bud getting ready to show it's beauty! Maybe one year we'll have many blooms to enjoy...but one is better than none right?? Flowers have a way of bringing people together. Darn... I so wish my puny little peonies would put on a show for me. Every year I'm hopeful.......mostly just lots of greenery. Lovely too, but I'd really enjoy the blooms. 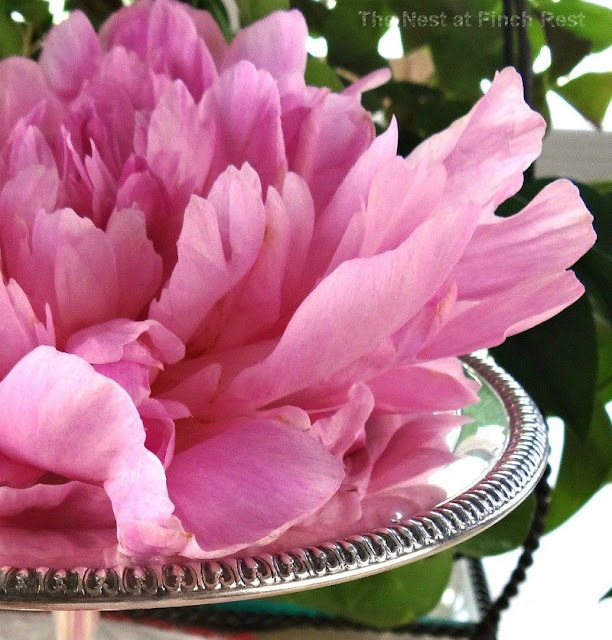 Lovely captures of these magnificent peonies! I too love peonies and wish I had some. 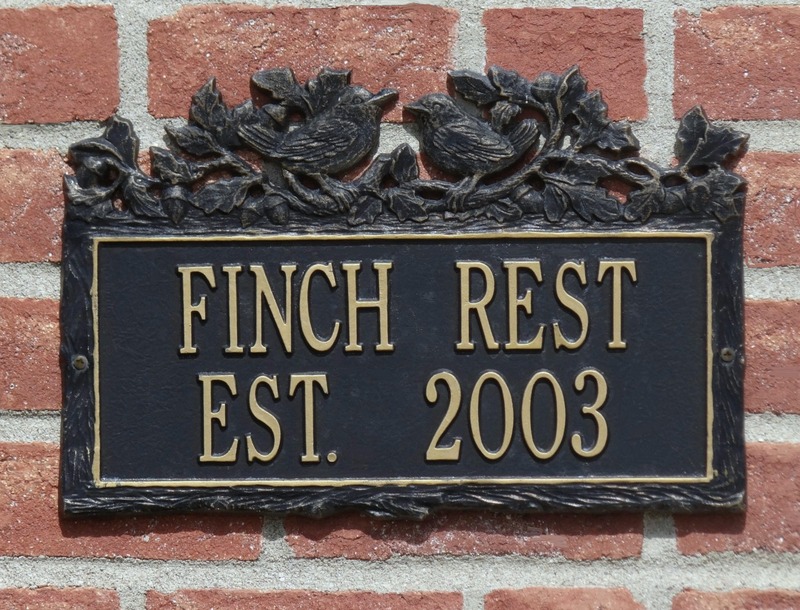 I hope to still get some planted yet. They are SO beautiful. Love your little vignette. Very sweet and the peonie is just gorgeous!! !